“Eyes are a precious gift to mankind. 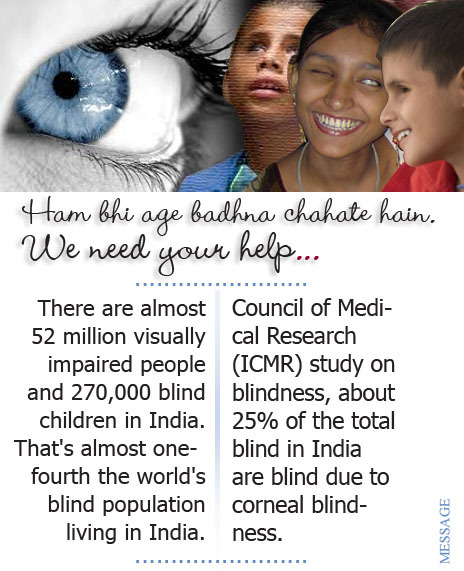 Join Us to spread awareness about eye donation. A Rally and a human chain will be organize on October 11th 2012 at Jaipur Rajasthan. There is no substitut human human tissue. The transplantation process depends upon the priceless gift of cornea donation (eye donation) from one human to the next. Eye Donation Motivate family members of the person who has died in your near about. Bees Dukan, Near Geeta Bhawan, Jaipur; 302004; India. The Rally and Human chain organized by TEAM EYE – Eye Bank Society of Rajasthan supported by MESSAGE Institution. The campaign Human Chain will be start from Albert Hall , Jaipur, Rajasthan at 4.30 Pm. 429, Adarsh Nagar, Bees Dukan, Near Geeta Bhawan, Jaipur; 302004; India. I really admire the way you have brought about significant points.